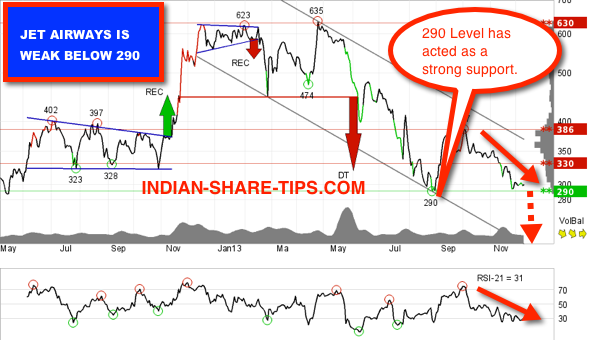 How to Trade Jet Airways to Make Money? We have analysed the chart of Jet Airways keeping in view its Ethiad deal and its likely prevalent trend in the forthcoming days ahead. Going through the post will help you make a judicious decision whether to buy or sell the stock. It is worthwhile to mention here that Jet Airways is one of the Highest Debt Laden companies in India and remember that worldwide aviation sector is bleeding. Analysis of the stock shows that the stock has broken the key support of 290 level and thus its fall within the channel continues. As a strategy one can be short below 290 level and above 290 level one can consider going long for tgt 313 in the short term. However till the time it sustain below 290; one can be short in the stock. The below screenshot will show the state of the stock. Our clients are short in the stock below 290 level. If looking to make money in intraday trading then do not trade without Hot NSE Stock of the day and if you have enough capital then consider going for the delivery stock tips to avoid any intraday volatility.